NC Sports New Canaan head coach Danny Melzer. NEW CANAAN — The decision did not come easily. 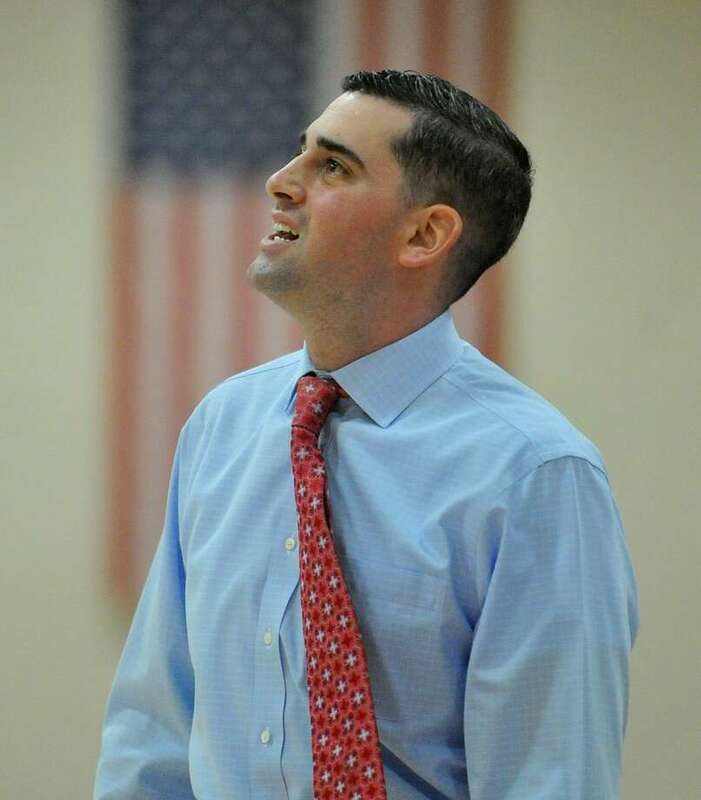 A Stamford Black Knight through and through, Danny Melzer had been offered the job of head coach of the New Canaan boys basketball team in 2016, taking over a struggling program. The move would mean leaving the school he had played and coached for, and the man who had been his head coach and, later on, athletic director: Jim Moriarty. New Canaan will play for its first state championship in 57 years when it takes on Granby Memorial in the CIAC Div. IV title game at 10 a.m., Saturday, at Mohegan Sun Arena. The Rams last appeared in a final in 1989, when they lost to Danbury 78-76 under coach Don Usher. They last won a state title in 1962 when they defeated Plainville, 49-48. The winning doesn’t surprise Melzer’s former head coach. “He’s a student of the game,” Moriarty said. “He was an excellent high school player, an excellent college player at Connecticut College, and he served a good amount of time as an assistant coach at Stamford High before becoming then head coach (for four years) and doing a great job. He’s the FCIAC Coach of the Year, which is deserved because he’s a had a great year with those kids. When Melzer got to NCHS, the team he inherited hadn’t been to the postseason since 2009 and hadn’t won a playoff game since 2008. The athletes were in place, but the dedication to basketball wasn’t. The kids took to the new philosophy, although it didn’t result in wins right away. In Melzer’s first two years, the Rams were a combined 9-31 before exploding this season with a 19-5 mark which includes an FCIAC playoff berth and a state tournament run to the title game. Melzer’s Stamford roots run deep, and the choice to come to New Canaan hasn’t changed that. “I definitely miss Stamford and I miss the people,” Melzer said. “When we’re not playing against them, I’m rooting for Stamford High. I’m still a Black Knight at heart — that’s my high school and my hometown and I won a state championship playing baseball there. Moriarty said it was difficult to watch Melzer leave the Knights. Melzer gives a lot of the credit for the program’s success to his assistant coaches, many of whom hail from Stamford as well. They include Mike Tiscia and Mike Macchio, who were on his staff at Stamford, along with Adrian Arango, Chris Satterlie and Mike McAteer. “This goes so far beyond me,” Melzer said. “We have the most dedicated, passionate and knowledgeable coaches that a head coach could ask for. These guys put so much time and effort into everything that we do. I’m very, very grateful to have them. “That was a major factor in my decision to come here. If they weren’t going to come with me, then I wasn’t going to take the job. That’s how important they are to my success and our success. They all deserve just as much if not more credit than I do. They’re phenomenal. Ironically, New Canaan’s most dramatic victory this season came against Stamford. Trailing 49-46 with less than a second remaining, the Rams tied the game when Aaron Fishman hit three consecutive free throws. Ryan McAleer then stole a long inbounds pass and banked in a 3-point shot from halfcourt to give the New Canaan a 52-49 victory at the buzzer. The drama even got Melzer to join in the celebration. No matter the outcome of Saturday’s state final, Melzer and his coaches have already achieved success at NCHS. The Rams now believe in themselves, the program has set a foundation, and the crowds have come back to the gym.